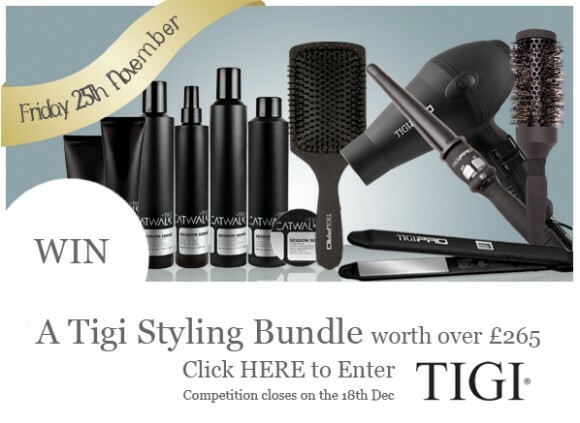 Win a whole complement of Tigi Haircare products in our special prize draw. Simply enter below by the 18th December. Tigi Catwalk provides couture hair styling for locks that are red carpet ready. Tigi Pro gives the professionals a high octane helping hand in creating any manner of styles. What happens when you combine the two? Possibly the biggest treat for a hair fan, ever. Today, we’ve got details of a huge competition prize to be won by one lucky person. This entire hair wardrobe includes everything you could ever need to help you to create any manner of styles, from the understated to the avant garde. Not only does the bumper prize include the entire Tigi Catwalk Session Series range, but you’ll also receive a Tigi pro Hairdryer, a Curl Stick, Flat Irons, and two large brushes to aid you in your perfect styling. If you’re stuck in a bad hair rut, this Flash Event could be your saving grace! To enter simply enter the prize draw on this page. It’s open until the 18th December and the lucky winner will be notified on the 20th December. This entry was posted on Friday, November 25th, 2011 at 8:00 am and is filed under Christmas, Gifts, Offers. You can follow any responses to this entry through the RSS 2.0 feed. You can skip to the end and leave a response. Pinging is currently not allowed.